Mamma Mia! (promoted as Mamma Mia! The Movie) is a 2008 jukebox musical romantic comedy film directed by Phyllida Lloyd and written by Catherine Johnson based on the 1999 musical of the same name, also written by Johnson, which itself is based on the songs of pop group ABBA, including the title song, with additional music composed by ABBA member Benny Andersson. The film features an ensemble cast, including Christine Baranski, Pierce Brosnan, Dominic Cooper, Colin Firth, Amanda Seyfried, Stellan Skarsgård, Meryl Streep and Julie Walters. The plot follows a young bride-to-be who invites three men to her upcoming wedding, each one with the possibility of being her father. The film was an international co-production between Germany, the United Kingdom, and the United States, and was co-produced by Relativity Media, Playtone and Littlestar Productions. Principal photography primarily took place on the island of Skopelos, Greece from August to September 2007. The film was distributed by Universal Pictures. Mamma Mia! held its world premiere on June 30, 2008 at Leicester Square in London and premiered on July 4, 2008 in Stockholm, Sweden, with Andersson, Björn Ulvaeus, Anni-Frid Lyngstad and Agnetha Fältskog in attendance. The film was released theatrically on July 10 in the United Kingdom, on July 17 in Germany and on July 18 in the United States. It received mixed reviews from critics, who praised the musical numbers and production values, but criticized the plot and casting of inexperienced singers, in particular Brosnan and Skarsgård. Nonetheless, the film was popular with audiences grossed $615 million worldwide on a $52 million budget, becoming the fifth highest-grossing film of 2008. A sequel, titled Mamma Mia! Here We Go Again, was released on July 20, 2018 with most of the main cast returning. On the Greek island of Kalokairi, 20-year-old bride-to-be Sophie Sheridan reveals to her bridesmaids, Ali and Lisa, that she has secretly invited three men to her wedding without telling her mother, Donna. They are the men that her mother's diary reveals could have been her father: Irish-American architect Sam Carmichael, Swedish adventurer and writer Bill Anderson, and British banker Harry Bright. She dreams of being given away by her father at her wedding, and believes that after she spends time with them she will know which is her father. Sophie's mother Donna, who owns a villa and runs it not very successfully as a hotel, is ecstatic to reunite with her former Dynamos bandmates, wisecracking author Rosie Mulligan and wealthy multiple divorcée Tanya Chesham-Leigh, and reveals her bafflement at her daughter's desire to get married. Donna shows off the villa to Rosie and Tanya. The three men arrive and Sophie smuggles them to their room. She doesn't reveal that she believes one of them is her father, but does explain that she and not her mother sent the invitations. She begs them to hide so Donna will be surprised by the old friends of whom she "so often" favorably speaks. They overhear Donna working and swear not to reveal Sophie's secret. Donna spies them and is dumbfounded to find herself facing former lovers, demanding they leave. She confides in Tanya and Rosie that she truly does not know which of the three fathered Sophie. Tanya and Rosie rally her spirits by getting her to dance with an all female ensemble of staff and islanders. Sophie finds the men aboard Bill's yacht, and they sail around Kalokairi, telling stories of Donna's carefree youth. Sophie plans to tell her fiancé Sky about her ploy, but loses her nerve. Sky and Sophie sing to each other, but Sky is abducted for his bachelor party. At Sophie's bachelorette party, Donna, Tanya, and Rosie perform. When Sam, Bill, and Harry arrive, Sophie decides to talk with each of them alone. While her bachelorette party friends dance with the men, Sophie learns from Bill that Donna received the money for her villa from his great-aunt Sofia. Sophie guesses she must be Sofia's namesake. She asks him to give her away and keep their secret until the wedding. Sophie's happiness is short-lived as Sam and Harry each pull her aside to tell her they are her father and will give her away. Sophie, overwhelmed by the consequences of raising the hopes of all three "fathers", faints. In the morning, Rosie and Tanya assure Donna they will take care of the men. Bill and Harry intend to tell each other what they learned the previous night, but Rosie interrupts them. Donna confronts Sophie, believing Sophie wants the wedding stopped. Sophie says that all she wants is to avoid her mother's mistakes. Sam accosts Donna, concerned about Sophie getting married so young. Donna confronts him and they realize they still have feelings for each other. Tanya and young Pepper continue flirtations from the previous night. Sophie confesses to Sky and asks for his help. He reacts angrily to Sophie's deception and she turns to her mother for support. As Donna helps her daughter dress for the wedding, their rift is healed and Donna reminisces about Sophie's childhood. Donna admits her mother disowned her when she became pregnant. Sophie asks Donna to give her away. As the bridal party walks to the chapel, Sam intercepts Donna, who reveals the pain she felt over losing him. Sophie and Donna walk down the aisle as the band plays. Donna tells Sophie and all gathered that her father could be any of the three men. Sam reveals that while he left Donna to get married, he did not go through with it, but returned to find Donna with another man. The men do not want paternity confirmed, each agreeing to be one-third of a father for Sophie. She tells Sky they should postpone their wedding and travel the world. Sam proposes to Donna, revealing that he is now divorced and has loved her all this time. She accepts and they are married. At the reception, Sam sings to Donna and Rosie makes a play for Bill. The couples proclaim their love. Sophie and Sky sail away. Meryl Streep as Donna Sheridan-Carmichael, Sophie's mother, owner of the hotel Villa Donna. Amanda Seyfried as Sophie Sheridan, Donna's 20-year-old daughter, Sky's fiancée. Christine Baranski as Tanya Chesham-Leigh, Donna's other former bandmate; a rich three-time divorcee. Julie Walters as Rosie Mulligan, one of Donna's former bandmates in Donna and the Dynamos; an unmarried fun-loving author. Pierce Brosnan as Sam Carmichael, Sophie's possible father and an architect. Colin Firth as Harry Bright, Sophie's possible father and a British banker. Stellan Skarsgård as Bill Anderson, Sophie's possible father, a Swedish sailor and travel writer. Dominic Cooper as Sky, Sophie's fiancé who is designing a website for the hotel. Niall Buggy as Father Alex, the wedding priest. Chris Jarvis as Eddie, a friend of Sky and Pepper. Juan Pablo Di Pace as Petros, Harry's partner. Enzo Squillino as Gregoris, one of Donna's employees. A soundtrack album was released on July 7, 2008 by Decca and Polydor in the United States and internationally, respectively. The recording was produced by Benny Andersson. The album features sixteen musical numbers within the film, including a hidden track. The album was nominated at the 51st Annual Grammy Awards for Best Compilation Soundtrack Album for Motion Picture, Television or Other Visual Media. The deluxe edition of the soundtrack album was released on November 25, 2008. † Featured in the film, but omitted from the soundtrack album. ‡ Included in the soundtrack album, but omitted from the film. § Included on the soundtrack album as a hidden track. The Agios Ioannis chapel during filming of the wedding scene for Mamma Mia!. Most of the outdoor scenes were filmed on location at the small Greek island of Skopelos (during August 29-September 2007), and the seaside hamlet of Damouchari in the Pelion area of Greece. 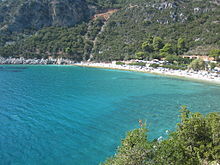 On Skopelos, Kastani beach on the south west coast was the film's main location site. The producers built a beach bar and jetty along the beach, but removed both set pieces after production wrapped. A complete set for Donna's Greek villa was built at the 007 stage at Pinewood Studios and most of the film was shot there. Real trees were utilised for the set, watered daily through an automated watering system and given access to daylight in order to keep them growing. The part of the film where Brosnan's character, Sam, leaves his New York office to go to the Greek Island was actually filmed at the Lloyd's building on Lime Street in the City of London. He dashes down the escalators and through the porte-cochere, where yellow cabs and actors representing New York mounted police were used for authenticity. The Fernando, Bill Anderson's yacht (actually a ketch) in the film was the Tai-Mo-Shan built in 1934 by H. S. Rouse at the Hong Kong and Whampoa dockyards. Meryl Streep took opera singing lessons as a child, and as an adult, she previously sang in several films, including Postcards from the Edge, Silkwood, Death Becomes Her, and A Prairie Home Companion. She was a fan of the stage show Mamma Mia! after seeing it on Broadway in September 2001, when she found the show to be an affirmation of life in the midst of the destruction of 9/11. Though the world premiere of the film occurred elsewhere, most of the media attention was focused on the Swedish premiere, where Anni-Frid Lyngstad and Agnetha Fältskog joined Björn Ulvaeus and Benny Andersson with the cast at the Rival Theatre in Mariatorget, Stockholm, owned by Andersson, on July 4, 2008. It was the first time all four members of ABBA had been photographed together since 1986. In November 2008, Mamma Mia! became the fastest-selling DVD of all time in the UK, according to Official UK Charts Company figures. It sold 1,669,084 copies on its first day of release, breaking the previous record (held by Titanic) by 560,000 copies. By the end of 2008, the Official UK Charts Company declared that it had become the biggest selling DVD ever in the UK, with one in every four households owning a copy (over 5 million copies sold). The record was previously held by Pirates of the Caribbean: The Curse of the Black Pearl with sales of 4.7 million copies. In the United States, the DVD made over $30 million on its first day of release. By December 31, 2008, Mamma Mia! became the best-selling DVD of all time in Sweden with 545,000 copies sold. In the United Kingdom, Mamma Mia! has grossed £69.2 million as of January 23, 2009, and is the ninth highest-grossing film of all time at the UK box office. The film opened at #1 in the U.K, taking £6.6 million on 496 screens. It managed to hold onto the top spot for 2 weeks, narrowly keeping Pixar's WALL-E from reaching #1 in its second week. When released on July 3 in Greece, the film grossed $1.6 million in its opening weekend, ranking #1 at the Greek box office. Mamma Mia! grossed $144.1 million in the United States and $471.6 million in other territories for a worldwide total of $615.7 million, against a production budget of $52 million. It became the highest grossing live-action musical of all time, until it was surpassed by Bill Condon's Beauty and the Beast in 2017. It was also the highest-grossing movie directed by a woman, until it was surpassed by Patty Jenkins' Wonder Woman in 2017. It is the third highest-grossing film of 2008 internationally (i.e., outside North America) with an international total of $458.4 million and the thirteenth highest gross of 2008 in North America (the US and Canada) with $144.1 million. The film made $9.6 million in its opening day in the United States and Canada, and $27.6 million in its opening weekend, ranking #2 at the box office, behind The Dark Knight. At the time, it made Mamma Mia! the record-holder for the highest grossing opening weekend for a movie based on a Broadway musical, surpassing Hairspray's box office record in 2007 and later surpassed by Into the Woods. On Rotten Tomatoes the film holds an approval rating of 55% based on 181 reviews, with an average rating of 5.5/10. The website's critical consensus reads, "This jukebox musical is full of fluffy fun but rough singing voices and a campy tone might not make you feel like 'You Can Dance' the whole 90 minutes." On Metacritic, the film has a weighted average score of 51 out of 100, based on 37 critics, indicating "mixed or average reviews". Audiences polled by CinemaScore gave the film an average grade of "A–" on an A+ to F scale. BBC Radio 5 Live's film critic Mark Kermode admitted to enjoying the film, despite describing the experience as 'the closest you get to see A-List actors doing drunken karaoke'. Peter Bradshaw of The Guardian was more negative, giving it one star, and expressed a "need to vomit". Bob Chipman of Escape to the Movies said it was "so base, so shallow and so hinged on meaningless spectacle, it's amazing it wasn't made for men". The Daily Telegraph stated that it was enjoyable but poorly put together: "Finding the film a total shambles was sort of a shame, but I have a sneaking suspicion I'll go to see it again anyway." Angie Errigo of Empire said it was "cute, clean, camp fun, full of sunshine and toe tappers." The casting of actors not known for their singing abilities led to some mixed reviews. Variety stated that "some stars, especially the bouncy and rejuvenated Streep, seem better suited for musical comedy than others, including Brosnan and Skarsgård." 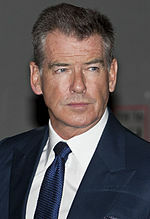 Brosnan, especially, was savaged by many critics: his singing was compared to "a water buffalo" (New York Magazine), "a donkey braying" (The Philadelphia Inquirer) and "a wounded raccoon" (The Miami Herald), and Matt Brunson of Creative Loafing Charlotte said he "looks physically pained choking out the lyrics, as if he's being subjected to a prostate exam just outside of the camera's eye." Because of the film's financial success, Hollywood studio chief David Linde, the co-chairman of Universal Pictures, said that it would take a while, but there would be a sequel. He stated that he would be delighted if Judy Craymer, Catherine Johnson, Phyllida Lloyd, Benny Andersson, and Björn Ulvaeus agreed to the project, noting that there were still plenty of ABBA songs to use.Mamma Mia! Here We Go Again was announced on May 19, 2017, with a planned release date of July 20, 2018. It was written and directed by Ol Parker. It was announced that Seyfried, Cooper, Streep, Firth and Brosnan would be returning. In July 2017, Lily James was confirmed to portray young Donna. ^ "Mamma Mia! (2008) | BFI". British Film Institute. Retrieved May 5, 2018. ^ a b c "Mamma Mia! (2008)". The Numbers. Retrieved 2009-02-05. ^ a b c Mansfield, Paul (2008-07-15). "Mamma Mia! – Unfazed by the fuss in Skopelos". London: The Telegraph. Retrieved May 12, 2010. ^ "FLAMIN - Page not found". 16 August 2011. Archived from the original on 16 August 2011. ^ "45' Teak Ketch 1933. Yacht for sale from classic yacht broker in Poole". Sandeman Yacht brokerage Poole. Sandeman Yacht Company. Archived from the original on 2016-03-04. Retrieved 2009-09-28. ^ "Tai-Mo-Shan". Coburg Yacht Brokers website. Coburg Yacht Brokers. Retrieved 2009-09-28. ^ Hiscock, John (2008-07-04). "Meryl Streep the singing and dancing queen". London: The Telegraph. Retrieved May 12, 2010. ^ Sandra Wejbro (2008-07-04). "ABBA återförenades på röda mattan (Swedish)". Aftonbladet. Retrieved 2008-07-06. ^ Sutherland, Mark (2008-12-31). "'Mamma Mia!' breaks U.K. DVD record". Archived from the original on 2009-01-15. Retrieved 2017-07-13. ^ BWW News Desk. "MAMMA MIA! DVD Takes In 30 Million In First Day Of Sales". Broadwayworld.com. Retrieved 2016-12-19. ^ "Nyheterna - tv4.se". nyheterna.se. Retrieved 20 September 2016. ^ "UK all time top grossing films". 25thframe.co.uk. Retrieved 2012-05-25. ^ "Greece Box Office Index". Box Office Mojo. June 10, 2008. Retrieved 2008-06-10. ^ Williams, Trey (2017-06-24). "'Wonder Woman' passes 'Mamma Mia!' as highest-grossing film by female director". MarketWatch. Retrieved 2017-07-05. ^ "Box Office Mojo". Box Office Mojo. July 19, 2008. Retrieved 2008-07-19. ^ "Mamma Mia! Reviews". Rotten Tomatoes. Retrieved 2012-07-07. ^ "Mama Mia reviews". Metacritic. Retrieved February 20, 2018. ^ "Mark Kermode Reviews Mamma Mia". BBC Radio 5 live. 2008-07-11. Retrieved 2016-12-19 – via YouTube. ^ Peter Bradshaw. "Mamma Mia! | Culture". The Guardian. Retrieved 2016-12-19. ^ "MOVIEBOB: Mama Mia". YouTube. 2008-07-25. Retrieved 2016-12-19. ^ "Telegraph review". The Daily Telegraph. Archived from the original on 2008-08-07. Retrieved 20 September 2016. ^ Angie Errigo (3 July 2008). "Mamma Mia! Review | Movie". gb: Empireonline.com. Retrieved 2017-01-27. ^ Jordan Mintzer (2008-07-05). "Mamma Mia!". Variety. Retrieved 2016-12-19. ^ "The Dark Knight – Mamma Mia! – The Exiles". Nymag.com. New York Magazine Movie Review. 2008-07-21. Retrieved 2016-12-19. ^ Rickey, Carrie (2008-07-17). "'Mamma Mia,' here we go again – this time on screen". Philly.com. Retrieved 2016-12-19. ^ Rodriguez, Rene. "Mamma Mia! (PG-13) **Â½ | Singing! And dancing! Not much of a story! Who cares!?! | MiamiHerald.com". Archived from the original on 2008-10-10. Retrieved 2017-01-02. ^ Brunson, Matt (2008-07-23). "Out of tune | Reviews". Charlotte.creativeloafing.com. Creative Loafing Charlotte. Archived from the original on 2011-06-16. Retrieved 2016-12-19. ^ Knegt, Peter (12 January 2009). "ACE Eddie Noms Announced". IndieWire. Retrieved July 22, 2018. ^ "Film Nominations in 2009". Film Awards – BAFTA. 2009-01-17. Archived from the original on 2009-01-17. Retrieved 2017-01-02. ^ "10th Annual Awards 2008". Costume Designers Guild. Retrieved July 28, 2018. ^ Reynolds, Simon (March 30, 2009). "Empire Awards 2009: The Winners". Digital Spy. Hearst Magazines. Archived from the original on 2018-02-16. Retrieved February 16, 2018. ^ "66th Annual Golden Globe Award Winners". Hollywood Foreign Press Association. Archived from the original on July 25, 2013. Retrieved July 25, 2015. ^ Wilson, John (2009). "29th Annual Golden Raspberry (Razzie) Award "Winners"". Home of the Golden Raspberry Award Foundation. Golden Raspberry Award Foundation. Retrieved 2009-05-01. ^ "2009 Golden Reel Award Nominees: Feature Films". Motion Picture Sound Editors. Archived from the original on June 30, 2012. Retrieved February 17, 2018. ^ "51st Annual Grammy Awards – 2008". grammy.com. Archived from the original on January 23, 2018. Retrieved January 21, 2018. ^ "Winners 2009 | IFTA | Irish Film & Television Academy | Irish Film & Television Awards". Irish Film & Television Academy. Retrieved July 22, 2018. ^ Sciretta, Peter (May 31, 2009). "2009 MTV Movie Awards Winners". SlashFilm. Archived from the original on April 11, 2013. Retrieved January 23, 2018. ^ a b Schmidt, Veronica (9 September 2008). "Mamma Mia wins at National Movie Awards". The Times. London: Times Newspapers Ltd. Retrieved 6 September 2010. ^ "People's Choice Awards Past Nominees & Winners: 2009". PCAvote.com. Sycamore Productions. Retrieved 2008-12-31. ^ van Oosten, Jasper (10 March 2009). "Oorlogswinter en Mamma Mia! winnen Film1 Rembrandt Awards". Film1. Retrieved July 28, 2018. ^ "Nominees and Winners; 2008 13th Annual SATELLITE Awards". The International Press Academy. Archived from the original on 2 December 2008. Retrieved 10 August 2010. ^ Baz Bamigboye (2008-10-17). "Baz Bamigboye on a possible Mamma Mia sequel, Kate Winslet, Leonardo DiCaprio and much more". Mail Online. Retrieved 2010-01-17. ^ Bryan Alexander (2017-05-19). "'Mamma Mia' sequel 'Here We Go Again' coming next summer". US Today. Retrieved 2017-05-19. ^ Anita Busch (May 19, 2017). "'Mamma Mia: Here We Go Again!' On Universal Pictures' 2018 Schedule". Deadline Hollywood. Retrieved May 28, 2017. ^ Mike Fleming Jr (June 1, 2017). "Amanda Seyfried Set For 'Mamma Mia!' Reprise". Deadline Hollywood. Retrieved June 1, 2017. ^ Zach Seemayer (June 22, 2017). "Dominic Cooper Dishes on Returning for 'Mamma Mia 2': It's 'a Phone Call I've Been Waiting For'". Entertainment Tonight. Retrieved June 22, 2017. ^ Jenna Busch (July 12, 2017). "Mamma Mia Sequel Casts Baby Driver's Lily James". Comingsoon.net. Retrieved July 16, 2017.